Media Composer has included a very powerful stabilize effect for years now, but putting all that power to work was not easy. You needed significant training to get up to speed with it. (I posted a introductory video back in ’08 that should help. It’s here.) But now, with version 5, the stabilize effect is one-button simple. Yes, there are still lots of controls, but for most purposes, all you need to do is drag the effect to a clip and watch while it automatically tracks and stabilizes the shot, blowing it up as needed. You don’t need to identify a location for a tracker because the effect analyzes motion across the entire image. 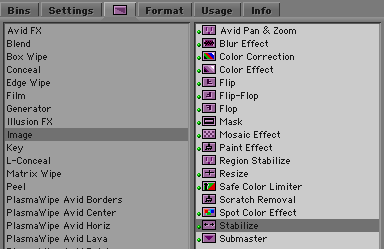 With the default options, camera moves are preserved, but small jittery motion is eliminated (Avid calls this SteadiGlide). In most cases, that’s exactly what you want, and no further adjustments are required. When it works, the effect can seem almost miraculous, fixing problems in an organic way that used to be impossible in a picture editing room. I’ve sometimes found myself checking the original shot just to make sure I’m not imagining the improvement. And best of all, the result plays in real time. No rendering needed. Try it. I think you’re going to like it. It’s one of the best small features in MC5. You’ll find it in the image category. This entry was posted on August 24, 2010 at 6:31 am and is filed under Avid, Avid Technical Tips. You can subscribe via RSS 2.0 feed to this post's comments. You can comment below, or link to this permanent URL from your own site.